The 4×6 Ft x 3/4 Inch Fitness Rubber Floor Mat in Diamond Black from Greatmats is one of the most durable, reliable, and longest-lasting floor mats you can find. This4×6 ft black fitness rubber matcovers a large area, gives you outstanding durability, and can be used for a seemingly-limitless variety of spaces. Thanks to outstanding service from the Greatmats team, you can use these 4×6 gym floor mats for your home, fitness center, horse barn or commercial area. But first, let’s learn more about these amazing 3/4 rubber mats. You can find 4×6 rubber mats in 3/8 inch and 1/2 inch thickness, but if you want outstanding strength and durability, you should choose 3/4 rubber mats. At 3/4 inches of thickness, you get the best possible protection for flooring. Of course, the added thickness also means added weight, as these 4×6 rubber mats weigh 105 pounds each. You’ll want to keep that in mind when moving and installing the 4×6 gym mat; you may need help safely moving them. These 4×6 rubber gym mats come in solid black and with 25% color fleck. All the black rubber material in the mix is made from a recycled rubber source. Rubber mats made from recycled material are extremely durable, and they are often less expensive than mats and rolls made from new rubber. In some cases, recycled rubber can be better for certain applications. These revulcanized rubber mats are non-absorbent, which helps protect against water damage, as well as mold growth. The top of this 3/4 rubber mat uses a diamond pattern, which helps increase traction and reduce the chances of slipping. With this non-slip surface, you’ll have great reliability and safety. This can be especially important if using the mats in a work space, but it’s also important for workout areas, horse barns and more. Because these mats are not UV treated and only they are not recommended for outdoor use. If you need an outdoor surface material, we have many other outdoor mats and tiles for you to choose from. The edges on this rubber mat are trued, which means the tile has very straight edges that are precision cut on a water jet cutting table. 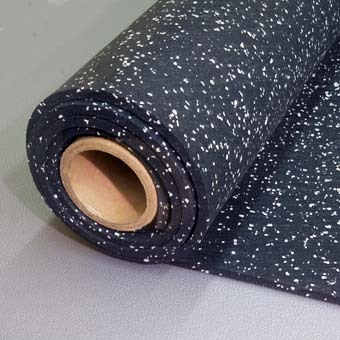 They do not have an interlocking connection, but there is no special adhesive required for installation, as the mats generally lay flat, especially when fitted properly. Choose this type of 4×6 rubber mat when you need a single product for use under exercise and weight lifting equipment. This rubber mat is very durable and long lasting, and will stand up to exercise equipment, free weights and large animals. You can place everything from weight benches to powerlifting stations over the mats with little concern of damage to the surface. They can withstand the impact of dropped metal weights, as well as the constant pressure from treadmills. With these 4×6 gym floor mats in your facility, you’ll have a durable, slip-resistant surface that holds up to constant pounding. These 4×6 rubber floor mats offer our customers an economical rubber mat option for use under heavy workout equipment, treadmills, stationary bikes and steppers. Because recycled rubber can have a strong smell, this mat is not recommended for individuals with a high sensitivity to smell. This is because the material is made with sulfur-based adhesives. Smells will fade over time. They are great for commercial weight rooms and athletic fitness centers on military bases and more with large spaces. These rubber floor mats are one of the most affordable and economical options when a durable and large single piece of rubber material is needed in weight rooms, workout rooms and gyms. This rubber mat is excellent for equine applications in horse stalls and aisle ways. Whether a horse is shod or bare hoofed, these mats give superior traction, helping reduce the chances of slipping and injuries to your prized animals. While they do not display a particularly cushiony or springy nature, they are easy horse’s joints, giving them relief from hard concrete and making stall mucking much easier than dirt or gravel floors. Because they are 3/4 inch thick, the mats will hold up against the weight of even the heaviest horses. Use this product on commercial walkways or any commercial location where a durable rubber flooring is required. They will lay flat when placed over a hard, flat surface while giving that surface superior traction. They can also hold up against heavy equipment while giving workers a slip-resistant work space. Because they are easy to clean, you’ll have a material that enhances the quality of your facility. From homes to commercial centers, these rubber mats will give you years of quality and reliability. At Greatmats, we believe that specialty flooring should be easy to install when at all possible. You should not have to deal with unique tools, special adhesives, or advanced connectors, and you certainly shouldn’t need an engineering education to place the mats together. Fortunately, these 3/4 inch rubber mats are simple to install, and nearly anyone can figure out the installation process, which requires no special adhesives or tools. The mats press up against each other tightly, forming a virtually seamless connection thanks to the trued edges. Jigsaws and reciprocating saws can also cut the material. The mats are a loose-lay product, and no adhesives are needed to place the mats. When the mats are in place and you move the first equipment over the flooring, you may notice some slight movement. While movement may be more noticeable with thinner mats, the 3/4 rubber mats may still move slightly. Don’t worry about shifting. Once the equipment is in place, the mats will lay flat and there should be no further movements. When you install these 4×6 rubber mats, you’ll have a product that is easy to clean. In almost all cases, sweeping and vacuuming is all that’s required to keep the mats clean. A beater brush vacuum works best for lifting dirt, dust and debris from the surface of the mats. If you have stubborn dirt and grime, you can remove it with warm liquid and a mild cleaner. In some cases, you may notice an odor after initial installation. However, this odor can usually be reduced by cleaning the mats after installation. Pine-Sol, Simple Green or even highly diluted bleach (about 1 cap per gallon of water) will help eliminate the smell. In all cases, be sure to test your cleaning method in a small corner before applying it to the entire mat. This is especially important when using cleaning chemicals and powerful vacuums. Never use petroleum-based cleaners. Because they are made from high-quality recycled rubber, these are some of the most durable and long-lasting mats you can find. To give you even more confidence in your purchase, the 4×6 rubber mats come with a five-year warranty. This warranty ensures the mat is free of defects in both the material and workmanship. The limited warranty runs from the date of the original purchase. If a defect is found, the customer has 15 days to contact us. If applicable, we’ll help you repair or replace the material as soon as possible. Greatmats has a wide selection of top-quality mats that you can use for nearly any space. From workout facilities to commercial applications, you can find the right surface for your unique needs. Contact us today or check out our full selection of high-quality mats!